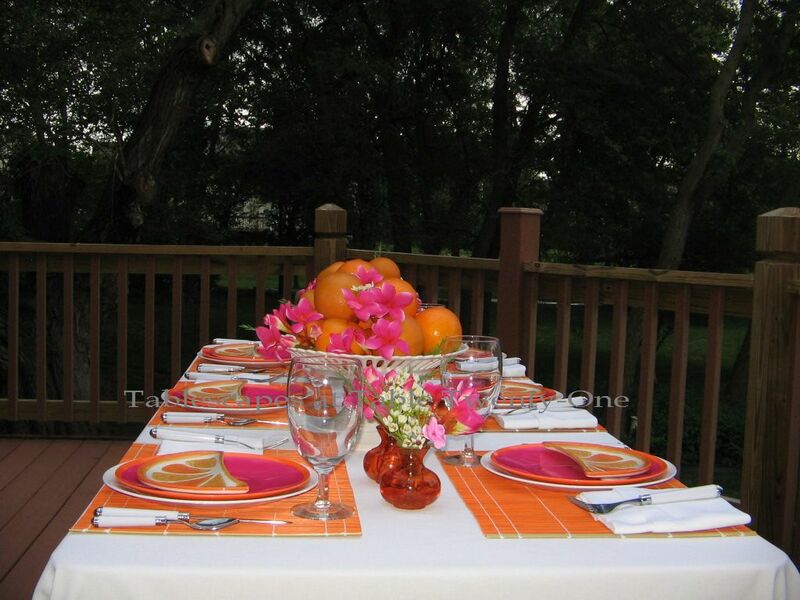 Some get-togethers are just a little more relaxed than others, but that doesn’t mean the tablescape has to suffer! 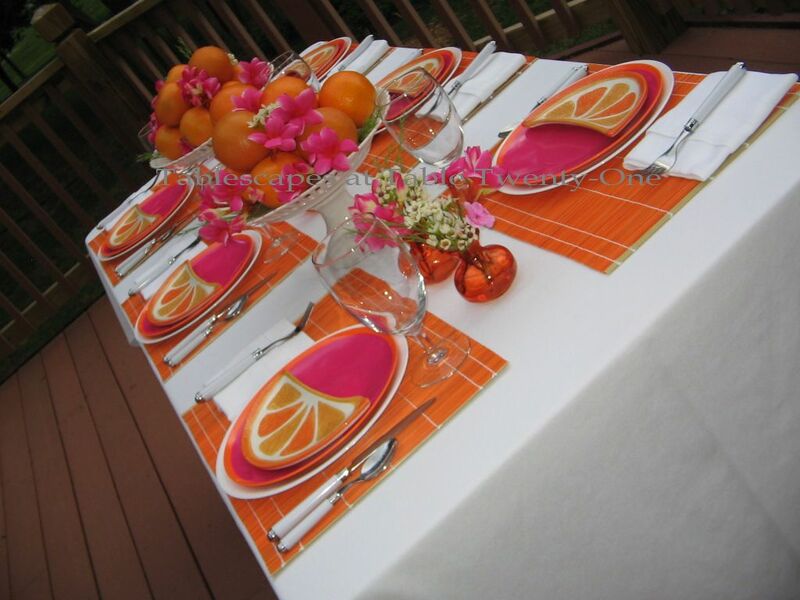 Bright colors can go a long, long way to bring a summer tablescape to life! With about 24 hours notice, I was able to construct this casual but inviting tablescape. 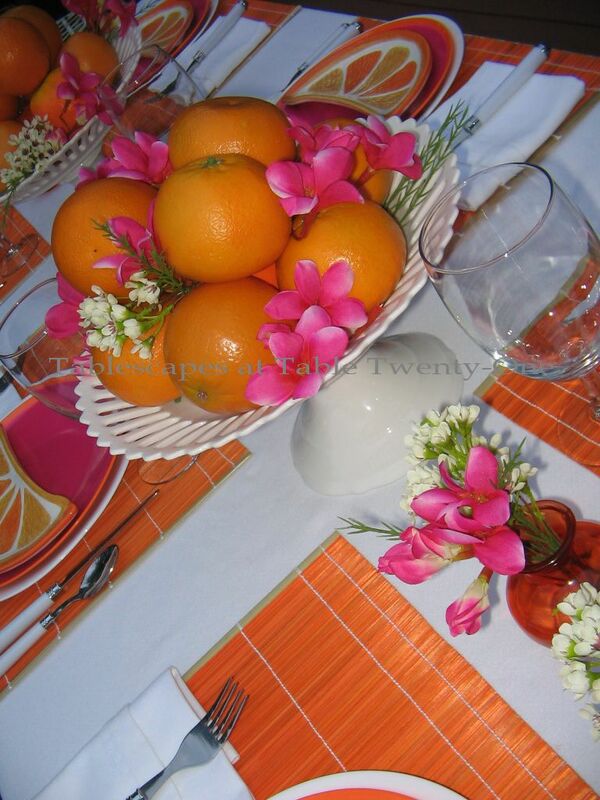 Atop a white cotton linen, the brilliant orange matchstick placemat really stands out. The next layers are a simple white Corelle dinner plate, a bright pink & orange melamine salad plate from Burlington, and a fun little orange slice plate for the appetizer. The place setting is finished off with a folded white napkin and fun white handled flatware from TJ Maxx. Nothing fancy…just pure fun! When it comes to centerpieces in a hurry, let your imagination kick in. A couple of white cake stands (Ralph Lauren “Pavillion”) did the trick in this case, stacked high with oranges from the fridge (tomorrow morning’s orange juice! ), and dotted with waxflower and brilliantly hued plumeria blossoms. Any small flowers will do that match or complement your tablescape colors. (See the cake stands used for other displays at “88 Years & 88 Keys” and “Blushing Bridal Shower“. Tiny orange glass vases from Hobby Lobby repeat the floral theme of waxflower and plumeria from the main centerpiece with impatiens from the side yard landscape tossed in for good measure. Simply using items from around the house, the fridge, and the yard, a jaunty little tablescape is born! This easy, breezy tablescape was quick to assemble and, thankfully, quick to take down as we were chased in just before dessert by a rain storm! Orange You Glad You Came to Dinner? ← Orange You Glad You Came To Dinner?